I know I have been really quiet with my haul entries... I mean, my last haul, according to my blog, was in September! Can it be true that me, Charlene J. Lee, has eradicated hauling from my life?!? Of course not! Haha. It will never ever happen. Like ever (Haha. I'm loving Taylor Swift's new album by the way.). This entry showcases the products that I bought during the past one and a half month. I made sure that I bought things that I really needed... Okay, that sentence is completely useless. If you ever have a chance to listen to my justifications for buying things, you will know that I need EVERYTHING. Heh. But I did steer clear from eyeshadow palettes, blushers, highlighters and the ilk. Like those that are considered the 'most unnecessary' items... Out of all the unnecessary ones. Haha. La Roche-Posay's Toleraine Fluid is one oil-free moisturizer that is incredibly lightweight. It sinks into the skin quickly and keeps my skin hydrated pretty much the whole day. I do, however, find myself applying this more than once if I spend long hours wrapped in artificial cold air (Which is pretty frequent nowadays. I mean, gosh! Singapore IS one massive furnace. I try to stay indoors as much as possible during the day! When the rain comes and everyone's grumbling, you find me doing a dance in my head even though I'm soaking wet.). La Roche-Posay's Hydraphase Intense Légère was what I used before Toleraine Fluid. Though it did a splendid job in moisturizing my skin, this isn't oil-free. Those with dry skin will certainly enjoy this. My fellow dehydrated friends will enjoy Toleraine Fluid instead. 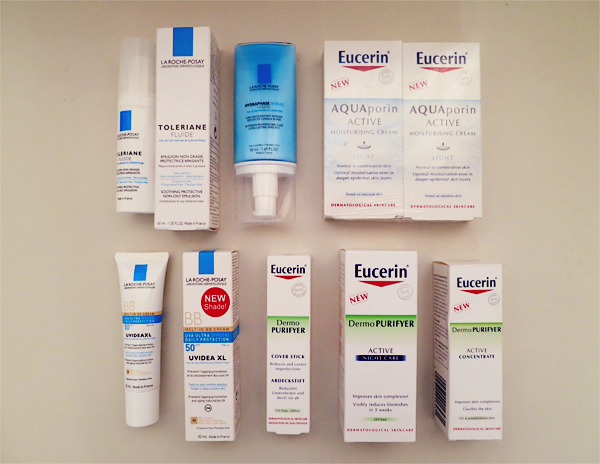 Eucerin is a brand that I really love and it's pretty evident in the above photo. Heh. The AQUAporin ACTIVE Light has really fantastic reviews online and I want to try it out for myself. Unfortunately, this comes with fragrance so I doubt I will repurchase this, even if I really like it in the end. Anyway, this is pretty pricey but Robinsons was having some package deal so I got 2 for $59.90. La Roche-Posay's UVIDEA XL Melt-In BB Cream SPF50 PA+++ in 02 is what I have been using since my facial. I wanted something that was healthy for my skin and this was the most suitable candidate then. I have tried Vichy's foundation and B.B. cream but unfortunately, my skin doesn't have any love for them. This, on the other hand, seems to make my skin smile. Lightweight and in the right shade, it sits comfortably on my skin for a good 5 hours and gives a semi-dewy look. Coverage is on the light side. I don't dust finishing powders at all, so I do oil up within the first hour (I just grab a piece of tissue paper and dab away.). I really enjoy this but I may have found something else that makes my skin smile wider and could possibly dethrone this (Read on!). Eucerin's DermoPURIFYER Active Night Care and DermoPURIFYER Active Concentrate are old friends, especially the former. I got them at the recent Watsons sale and they were each 5 to 6 bucks cheaper. SCORE!!! Haha. Uriage's Déodorant Tri-Actif is my first deodorant in years! I have really sensitive skin so deodorants cause a lot of grief for me. I got this because Uriage is actually a brand that I have been eyeing on and this contains the Thermal Spring Water and is alcohol-free, gas-free and hypoallergenic. I have only used this a couple of times and it's not too bad. It's light, keeps me fresh all day and my skin doesn't react to it. 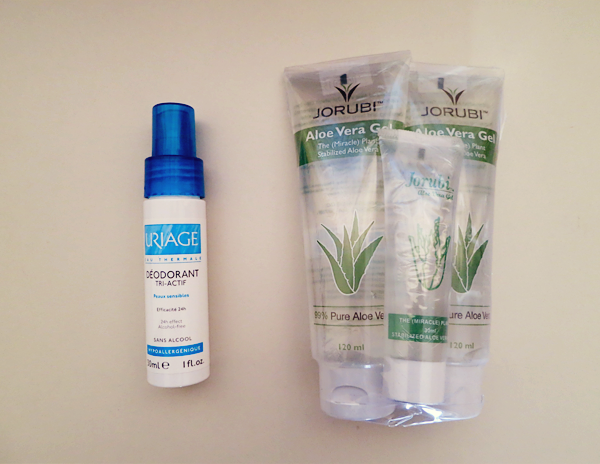 Jorubi's Aloe Vera Gel is godsent! I use this on wounds and they heal really quickly and nicely. I have also been applying this on my eczema areas and it helps to stop the itch. Just a little of it will suffice. I find that if I get too generous with it, it dries to a thin film, which doesn't feel all that comfy. Everyday Minerals' foundation colour testers in Fair, Fairly Light and Multi-Tasking Neutral and finishing powder testers in Finishing Dust and Sunlight Finishing Dust are just some things which I want to try. I have used the foundations before and they are pretty okay. Not fabulous but they do their jobs and I don't break out. Each set was $2 each, from NaturaWorks. Dita Von Teese is one of the most beautiful women walking on this Earth right now and I love her style so much. A while ago, Into The Gloss interviewed her and she mentioned that Obliphica 'totally changed (her) life'. 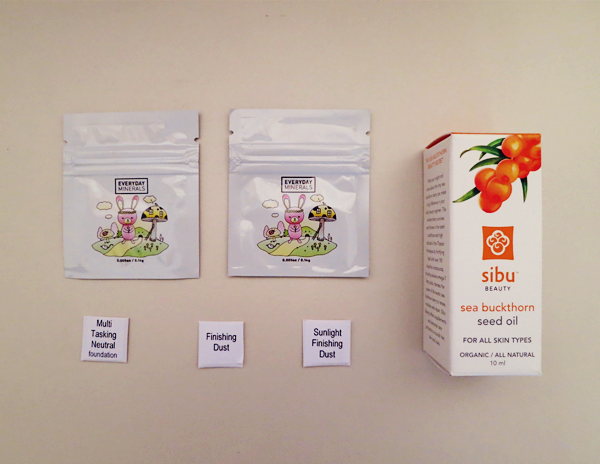 I did my research and found that the core of Obliphica's products lies in the Sea Buckthorn, so I decided to get Sibu Beauty's Organic Sea Buckthorn Seed Oil when I saw it on NaturaWorks. This is really pricey; $24.90 for 10ml. Even though this is meant for the face, I will be using this on my permed hair instead. Fingers crossed that this is gold. 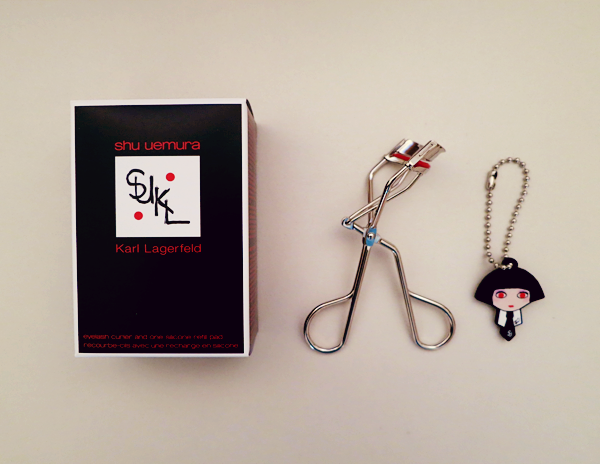 Shu Uemura's Eyelash Curler is my 2nd eyelash curler. I actually own the Anna Sui one but I never learnt how to use it properly so I... Well, basically just let it sit prettily in my cupboard. Fel was talking about eyelash curlers a few weeks back and we decided to check the Shu Uemura one. And it just so happened that the Karl Lagerfeld for Shu Uemura Holiday Collection 2012 was launched that day. The Shu lady taught us how to use the eyelash curler properly, which isn't hard at all and makes quite a significant difference (Seriously, Chalene. Why did you never learn how to use one before this! ), and we both got one each. This is $28, unlike the 'normal' one which is $32. However, do note that this is made in Taiwan, instead of Japan. I read this in a blogger's tweet and when I checked with the Shu lady, she insisted that this was made in Japan and that everything was made in Japan. Not that it matters to me and she was very nice, but still, I think that it's the duty of the counter ladies to know their stuff. I do wonder if there's any difference though. 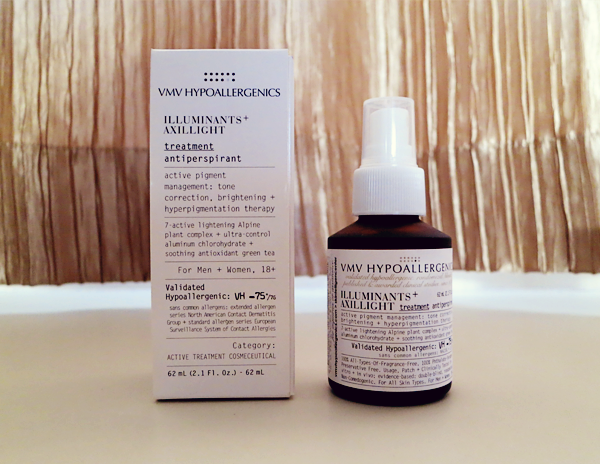 VMV Hypoallergenics is a brand that I met in my October Vanity Trove. I have yet to use my samples but just the other day, dear Juliet blogged about her loot from the brand here. And being the curious cat, I started googling and googling and it quickly escalated into wanting. Then, needing (As usual.). Initially, I had my heart set on the Antioxidant 2-Way Powder Foundation because I came across a review of it that seriously praised it to high heavens. Unfortunately, this hasn't made its way to our country yet. 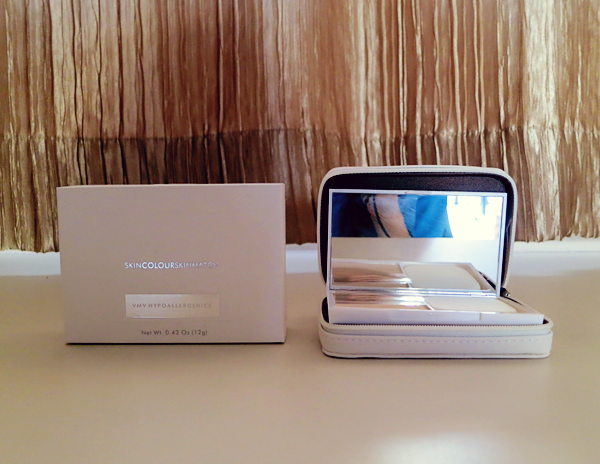 ): The VMV Hypoallergenics lady showed me the Illuminants Brilliant Finish (SPF) 25 Powder Foundation instead. ... OMG!!! I do believe that my skin has found her soul mate! And yes, this may be the reason why I won't be purchasing La Roche-Posay's UVIDEA XL Melt-In BB Cream SPF50 PA+++ anymore. The colour fitted me better than I expected. I applied the foundation the dry way and it gave me flawless skin in the most natural way. Usually, I find that powder foundations emphasize the many milia seeds on my face. But this didn't! However, it did highlight the little dry bits on the tip of my nose. I went out with this for 2 hours, walking under the blazing sun and came back all sweaty but with a T-zone that was only slightly oily. I usually oil up really fast so this was surprising. It didn't oxidise on me and sat very comfortably on my skin the entire time. BUT the thing that really got me jumping up and down was that when I washed the foundation off, my skin felt so, so friggin' soft! I kept touching my skin during my shower to make sure that I wasn't dreaming! Also, the dry bits on the tip of my nose seemed to have vanish into thin air (The lady did tell me that this would help moisturize my skin.)! But before I get carried away and order a whole box of it from the website, I need to restrain and remind myself that this is but only a first impression. I shall test it out properly for a few months first and if all goes well, I'm sticking to this for the rest of my life! Oh yes! I got this at $38, instead of the retail price of $48. (: Right now, if you spend $50 and above at VMV Hypoallergenics, you get a $10 voucher which can be used on your next purchase. Anyway, besides the whole lot that I mentioned above, I also bought Kate's Super Sharp Liner in RD-1. This limited edition red eyeliner is part of the Fall/ Winter Collection 2012. I tested this out in the stores and it's a pretty deep red so no worries about your eyelids looking like they are bleeding. Unfortunately, this isn't waterproof.